Well, our flight to Vancouver never came to be and we ended up rebooking another flight for this upcoming Saturday night. If that one is canceled? Then I guess we're not supposed to go to Saint Lucia this year. ;) But in finding out that we'll be here for Christmas after all, we're scrambling a bit to get a little into the festive holiday spirit. On Monday a small turkey was bought, a little Christmas Eve party had been planned with a couple of friends (weather isn't permitting, darnit), and last night the Christmas cookies were baked. Sim made his favourite- the gingerbread men. The house smelled loverly. And me? 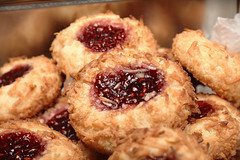 I made raspberry jam-filled thumbprint cookies. And they are so yummy! So of course, what better blog fodder can there be but a recipe? This gem is one of Ina Garten's. Due to sheer amount of cookies in one batch, I halved this recipe and it turned out just fine. In an electric mixer fitted with the paddle attachment, cream together the butter and sugar until just combined, and then add the vanilla. Separately, sift together the flour and salt. With the mixer on low speed, add the flour mixture to the creamed butter and sugar. Mix until the dough starts to come together. Dump on a floured board and roll together into a flat disk. Wrap in plastic wrap and chill for 30 minutes. Roll the dough into 1 1/4-inch balls. (If you have a scale, they should each weigh 1-ounce.) Dip each ball into the egg wash and then roll it in coconut. Place the balls on an ungreased cookie sheet and press a light indentation into the top of each with your finger. 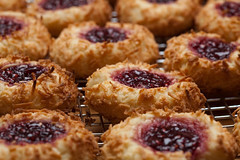 Drop 1/4 teaspoon of jam into each indentation. 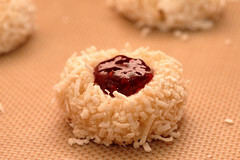 Bake for 20 to 25 minutes, until the coconut is a golden brown. Cool and serve.